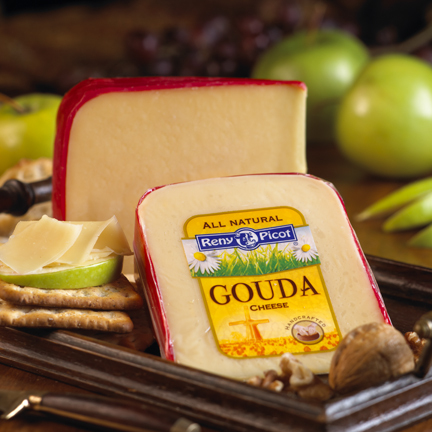 Buttery and salty, Gouda is mild and finishes with a slightly sweet caramel undertone. The hickory smoke flavor is subtle, yet pronounced, without the bitterness often associated with liquid smoked cheeses. The fusion of flavors will ignite nostalgia of slow fire roasted foods. You’re Gouda love it. Early on, Dutch cheese makers developed cheeses with exceptional keeping qualities. These cheeses were easily transportable and reliable, rather than exotic. Gouda, which typifies that style of Dutch cheese making, originated in the 13th century on farms around the village of Gouda. This delectable cheese has been hickory cold smoked in the traditional Dutch farmhouse manner, which forms its distinctive natural brown rind. 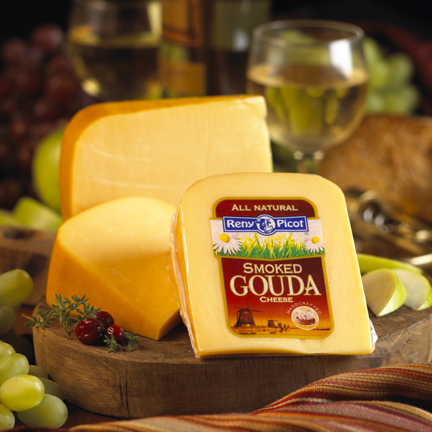 Gouda is a semi-soft, pressed, and uncooked cows’ milk cheese, which is molded into thickly rounded edge wheels. 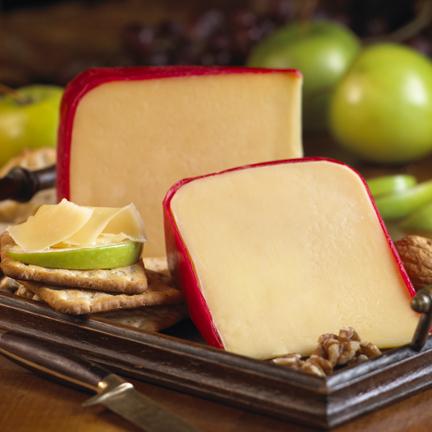 Smoked Gouda has a golden brown rind, which forms during the hickory cold smoke process. The paste is firm and straw-colored with small pea size holes scattered throughout. World-class Gouda will have no more than one hole per “sonde” (cheese plug). The cheese is ripened for at least 30 days before smoking and then another 30 days prior to shipment. Smoked Gouda should be buttery, mild with a slightly sweet caramel undertone. The hickory smoke flavor is subtle and yet pronounced without the bitterness associated with liquid smoked cheeses. The Smoked Gouda’s flavors remind one of slow fire roasted foods. Ideal storage temperature is 40 – 45 degrees Fahrenheit with an elevated humidity of approximately 65%. Keep the cheese under refrigeration and wrap the cheese in waxed or parchment paper. Store in a sealed plastic container pierced with a few holes for air circulation. If the cheese appears to be drying out, place a clean damp paper towel in the bottom to elevate humidity.